Getting to 50,000 words is one thing. But the novel itself is - even at 50,000+ words - halfway through. I haven't even gotten to the breaking point for one of the main characters, and the climactic battle not yet in sight. The month of December is gonna be both a continuing writing frenzy and a push to get the first draft (oh Lord is it rough) cleaned up for any half-decent publishing attempt. The trick isn't to write a published novel right out of the gate. The trick is to write something you can work with. Get the ideas out there. Create. 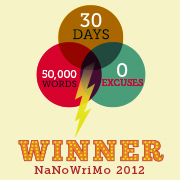 I did hit 25,000 words yesterday which is on pace for the 50,000 words needed for the month. Now it's a question of exceeding the pace, both tonight as well as tomorrow (Saturday). I'm falling about 5,000 words off the pace. Ack. As of this morning, the official NaNoWriMo word count is: 6110 words. I will update to this evening, and give the statistical numbers such as words per day, expected completion date, and level of awesomeness.